The C131 Terzuola Slipit was introduced in 2009. 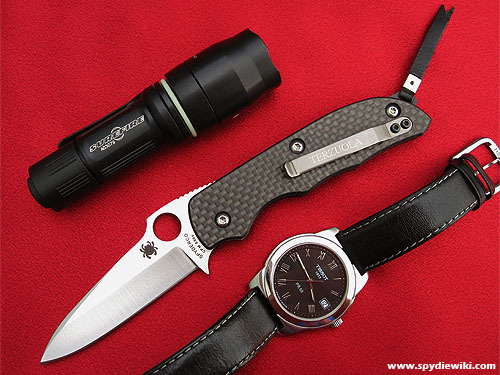 The C131 is the first Spyderco model featuring the Ball Joint non-locking mechanism. Robert "Bob" Terzuola, a custom knife maker in USA. Review and discussion of the C131 started by "FLYBYU44". Comments on the Ball Joint non-locking mechanism. "You see interesting knives and equally interesting people when walking the aisles of a knife show. Small by business standards and specialized in nature, the cutlery industry has names everyone knows. 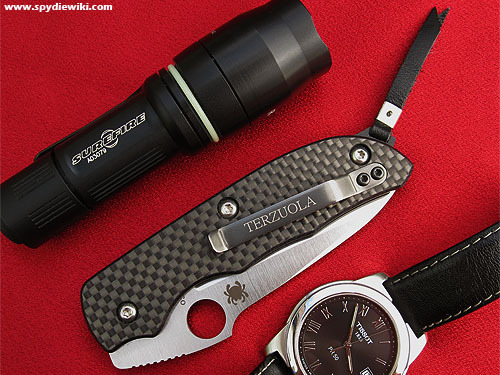 One is Bob Terzuola, we call him Bob T. Bob’s made handmade knives since the 1970s, has collaborated with the top production companies and acknowledged as the founder of tactical knifemaking. In our small industry he’s rock star. His designs are clean, militaristic, finely polished and perceived as having a high-level of performance and physical appearance. His fourth collaboration with Spyderco is the Bob T SLIPIT. The Terzuola Slipit closed, with 'friends'. This page was last modified on 7 December 2011, at 02:38.